Assalamu ‘alaykum, peace be upon you. So, I decided to visit Yokohama and see for myself! Yokohama is easily accessible from the Haneda Airport International Passenger Terminal. The airport also has a wonderful prayer room where I could pray in peace and tranquility. You can get to Yokohama Station by train or bus in 30 to 40 minutes. Travel is very convenient if you have an IC card, because you don’t need to buy a ticket every time you ride a bus or train. On we go to Yokohama Station, and the start of my sightseeing adventures! Near the East Exit of Yokohama Station is the Yokohama City Air Terminal (YCAT for short), from which buses depart frequently for Haneda Airport and Narita Airport. From here, it’s a 40-minute bus ride to the Haneda Airport International Passenger Terminal, or an 85-minute ride to Narita International Airport. YCAT also has a foreign currency exchange office, as well as a souvenir shop. Near YCAT, there are also food and drink shops, and even department stores; a very convenient area indeed! From YCAT, I walked to Yokohama Station via the basement market, and then took the train to Sakuragicho Station, where I found the Sakuragicho Station Tourist Information Center in the station building. You can leave your luggage with the staff here, and if you do so before noon, you can have it delivered to your hotel by evening that day. Now I was free to explore! The staff even showed me some recommended sightseeing spots on the map. And by the way, my luggage made it to the hotel right on time! 5:00 a.m. ～ 7:30 p.m.
Like Japan, Indonesia is an island nation, and therefore maritime routes are always busy. The bustling port town of Yokohama is one such example, and has been open to outside countries since long ago. For us Indonesians, the grand port facilities, giant cranes, and massive ships are very familiar sights. The Yokohama Port Museum is full of displays which tell us about the history of Yokohama Port, maritime transportation, and shipbuilding. I learned that the Port of Yokohama played a vital role in Japan’s industrial development. I also got to try a ship steering simulation; of course, I even cleared the docking part! Moored at one of Yokohama’s now-unused docks is the Sail Training Ship NIPPON MARU. The NIPPON MARU was built in 1930 as a training sailboat, and remained in service until 1984. A lot of sailors got their start on this ship! It’s truly a beautiful ship, and must have been even grander as it navigated the Pacific with its sails unfurled. You can board the ship and make your way to the navigation room, where you can see what it’s like to be a ship’s officer. By the way, the NIPPON MARU is equipped not only with sails, but also a diesel engine. The sails were rolled up when I visited, but they’re unfurled during special events held several times each year. I couldn’t see it in person, but I was able to find a picture of the sails in full flight! The tallest building in all of Yokohama is the Yokohama Landmark Tower, near JR Sakuragicho Station. It has 70 floors, and rises to a height of 296 meters, which makes it the second tallest building in all of Japan! The building itself houses offices, a hotel, shops, and restaurants, some of which offer pork-free menus. During my visit, I stopped off at the 69th floor observation deck, called the “Sky Garden”. Looking out from Sky Garden, you can see far past the buildings and port of Yokohama, all the way to the mountains in the distance. It was so high up, I felt like I was looking down from an airplane. If the skies are clear, you can even see Tokyo Skytree and Mt. Fuji! At the Tower Shop, you can buy lots of Yokohama souvenirs. I especially liked the “Tower Water” water bottles in the shape of the Landmark Tower. You can’t experience a view from heights like this in Indonesia, so I definitely recommend visiting for yourself! Today, I spent some time at YOKOHAMA WORLD PORTERS, a major shopping center in the Minatomirai 21 area. There are an incredible 200 shops and restaurants here, offering everything from trendy retail goods to quintessentially-Japanese dining. Muslim shoppers will be pleased to know that there is also a prayer room on the 6th floor. There is even space to perform Wuḍūʾ, so you may cleanse your hands and feet before praying. To use the room, just come to the information counter on the 2nd floor and fill out a simple form. While you’re there, you can even borrow a mat and qibla compass. I ate at Magurodonya Miuramisakiko on the 1st floor. It’s a typical conveyor-belt sushi restaurant, but the chefs will make you fresh sushi if you request it. When it comes to sushi, you just can’t beat the authentic Japanese version! If you find yourself in the Minatomirai 21 area, be sure to stop by and see what this place is all about! Open everyday except otherwise noticed. Saturdays, Sundays, Holidays 10:30 a.m. – 9:00 p.m. If you asked me what the most iconic sightseeing spot in Yokohama was, I’d say it’s the area between Yamashita Park and the Red Brick Warehouse. There are an incredible number of things to see and do here. You can visit the port and Yokohama Marine Tower and the mighty Hikawa Maru which once traveled the Pacific Ocean. You can also admire the rose gardens and fountain, historical hotels, the distant high-rise buildings, and the Yokohama Osanbashi International Passenger Terminal. Looking for trendy shopping? The Yokohama Red Brick Warehouse is full of stores and gourmet dining restaurants. The best of Yokohama is jam-packed into this one small area! From Yokohama Marine Tower, I gazed out upon the cityscape. I could also look straight down at Yamashita Park and the Red Brick Park before heading there on foot. The feeling of being in Japan’s most famous port city made really excited! As I walked to Osanbashi, there just happened to be a huge cruise ship docked there. The night scenery here is absolutely beautiful, and very romantic. In fact, this is one of the most popular date spots in all of Japan. Seeing it for myself, I could understand why so many movies and TV series choose to film scenes here. When asked what the highlight of Yokohama is, many Japanese people will tell you it’s all about Chinatown. We also have one in Jakarta, but Yokohama’s is on a whole different level. The closest station to Yokohama Chinatown is Motomachi-Chukagai Station on the Minatomirai Line (about 10 minutes by train from Yokohama Station). From the Yamashita Park/Yokohama Marine Tower area I showed you last time, it’s only a few minutes on foot. Said to be the biggest of its kind in Asia, Yokohama Chinatown consists of over 600 shops, of which more than 200 are Chinese restaurants. As I left the station and passed underneath the “Zenrinmon” gate, I was amazed by the dazzling, colorful world I suddenly found myself in. Pork is frequently used in Chinese cuisine, including soup stock, and therefore I cannot eat such dishes. However, if you phone ahead and make reservations at Yoshu Hanten Chinese Restaurant, you can request that they use vegetable-based stock and exclude any pork from your meal. I chose to eat here, and was delighted by the kaleidoscopic arrangement of delicious dim-sum, egg soup, chicken stir-fry, and onion fried rice. And most of all, I was deeply moved by how kind and accommodating they were to a Muslim diner like myself. Just 20 minutes by bus from the heart of Yokohama and its towering modern architecture is a little slice of traditional Japan called Sankeien Garden. This Japanese-style garden was created by a prominent businessman over 100 years ago, and features real, traditional Japanese buildings transported from all over the country. Here, you can experience an authentic version of old Japan, such as the beautiful pond with the three-storied pagoda on the opposite shore, and other highlights like the iconic “gassho-zukuri” houses we all know from the World Heritage site of Shirakawa-go. At the tea house, a traditional tea ceremony master prepared matcha tea for me. I was even lucky enough to try making it myself, but mastering the fine movement of the tea whisk is harder than it looks. Still, the bitterness of the matcha paired with the sweetness of wagashi confections is a wonderfully relaxing combination. 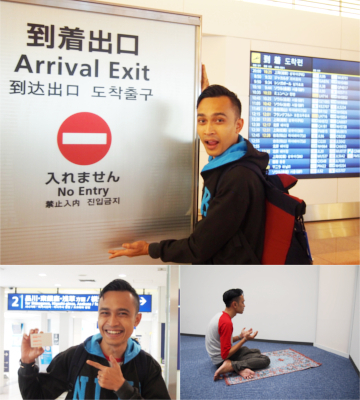 When I asked at the main entrance, I was given permission to use an open space to perform my prayers in peace. Sankeien Garden is a wonderfully soothing place. I definitely recommend it! 30 minutes by train from Yokohama Station is Hakkeijima Sea Paradise, which combines an exciting theme park and aquarium. Here, you can spend the whole day playing and learning. First up is the aquarium! I was astounded by the sharks, rays, and huge schools of sardines swimming about the gigantic tanks. At the Aqua Museum show, you can see dolphins up close and leaping into the air, and at the Sea Boat attraction, I hear that the dolphins will swim right alongside you! I especially enjoyed the fishing pond. It was my first time fishing, but I had a great time. Even better, you can have the fish grilled right before your eyes, or handle the cooking yourself. I chose to grill my own fish this time. I also bought and grilled some squid. There were lots of other attractions to enjoy as well, such as the Viking ship ride. It was so intense that I couldn’t help screaming! I’m eager to try Yokohama’s culinary delights, but sometimes I just want a taste of home. I’m sure that Japanese people, or people of any country for that matter, feel the same way when they’re traveling. Indonesian Kitchen iskandal is right near Isogo Station on the JR Negishi Line, which connects to the Keihin-Tohoku Line. That’s roughly halfway between Hakkeijima Sea Paradise and the Minatomirai area. Just in case you were wondering, the restaurant also serves pork dishes and alcoholic beverages to accommodate all customers. Familiar Indonesian dishes that do not contain pork include “lumpia” (spring roll with shrimp), “rendang” (beef boiled in coconut milk), and “nasi goreng” (Indonesian fried rice). The restaurant also plays Indonesian music, which made me feel like I really had come home! Be it sightseeing or dining, Yokohama really does have everything! There are three zoos in the Yokohama area, but I decided to check out Yokohama Zoological Gardens ZOORASIA because it brings you the closest to nature. One of ZOORASIA’s most popular animals is the okapi, an extremely rare animal closely related to the giraffe. Only three zoos in all of Japan have okapi, so this is a must-see! I also tried the camel ride attraction, where I had the chance to ride a dromedary camel. It’s a shaky ride, but the camels were super-friendly. I even got to take a picture with them, and made some fond memories. Meanwhile, at the bird show, you can watch different birds showcase their incredible abilities. If you’re lucky enough to be chosen as a volunteer, you can catch a hawk on your arm as it swoops in from 20 meters away! *Note that the bird show is subject to cancelation. Tuesdays (open if holiday), year end & new year holidays. One of the items on my “must-eat” list in Japan is ramen. If you feel the same way, then you’ve gotta check out the Shin-Yokohama Raumen Museum. You can get to Shin-Yokohama Station via the Shinkansen, or a 20-minute subway ride from Yokohama Station. Upon entering the museum, I thought I’d wandered outside and it had suddenly become evening! But it was actually a recreation of a typical Japanese neighborhood from 50 years ago. Vegetarian-friendly ramen is available, so even Muslims like me can eat worry-free. Out of the nine ramen shops here, four serve vegetarian ramen. I ate at two of those restaurants. There are also halal instant noodles you can buy as souvenirs in a variety of flavors. I was even able to borrow a room to perform salat. And so, my Yokohama adventure comes to an end. I work for a Japanese company back in Jakarta, and when asked by an employee at our Japanese headquarters “What did you like most about Yokohama?”, I immediately answered “The kind people”. Of course, the tall buildings and delicious food were great, but the genuine kindness of everyone I met made Yokohama truly wonderful. I will definitely encourage my friends to visit, and I hope to come back myself someday. I’d like to close with a message to my fellow Muslims thinking of visiting Yokohama. year end & new year holidays, other specific day. Free for children younger than 6 years old.